Posted on February 28, 2016 Author David	No Comments on Why Bother With Social Media If You’re A Doctor? Why Bother With Social Media If You’re A Doctor? Only about 20 percent of all physicians are social media users. Of those doctors who do use social media, only about six percent use Twitter. Social media isn’t a big part of healthcare culture. Many question the value it brings. And, of course, social media also has some severe downsides. We’ve all heard about the celebrity who gets angry and tweets something disastrous. That happens to doctors, too. They get angry and send some sort of career-ending tweet because it’s just so easy to push content to so many people at once. Mix tweeting with a tired physician who’s frustrated by the system and a dumb move is likely to occur. Social media is the ultimate permanent record—you can never get rid of an indiscreet message. And social media can be a very sloppy record, too, with its recording all sorts of incorrect information. With all that perceived downside, why bother with the tinderbox of social media at all? I’ll share one of my own reasons for bothering: by not participating, I have no control at all over what is posted about me online. A few stories: at one point there was positive content about me on the website of an organization. When a potential employer searched my name online, that website came up near the top. Sounds fine, except I didn’t want to be associated with that organization at all. I also didn’t want to say anything bad about that organization, and being associated with them closely was going to raise questions that would make it difficult for me to keep things positive. I started thinking about it and realized that I have almost no control over the content of other sites, good or bad. Another example: I found a site that said I was a cardiothoracic surgeon. (I’m not.) The picture was of somebody else, but it had my correct address and the profile was obviously me. Another site had the right photo but all the other information was wrong. I decided I had to control what was out there about me, or at least have a say in it, because the wrong information was only going to get worse. I had lots of five-star reviews on the doc rating sites but I knew it couldn’t stay that way forever. At some point, for whatever reason, someone was going to write something bad about me on one of those sites and, ut-oh, that wouldn’t be easy to get rid of. That can happen to anyone but it’s a particular hazard in medicine. We see thousands of people a year at a bad time in their lives. They’re sick, stressed, in pain, and maybe angry. I’ve seen some of those critically ill patients in the ICU on their laptops. So consider this: versed plus free hospital wifi equals “fail” for the ICU setting. 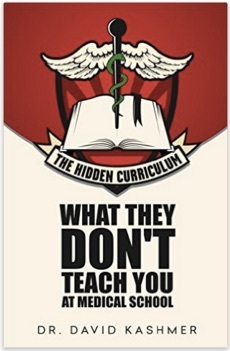 The excerpt above is from The Hidden Curriculum: What They Don’t Teach You In Medical School. For more information, and social media tools, tips, & tricks (starting on page 125) find the book here. Posted on February 8, 2016 Author David	No Comments on Here’s How The World Changes Before Your Book Release! Here’s How The World Changes Before Your Book Release! Did you know that by the time a textbook is released, it’s 4 years out of date? When I’ve written textbook chapters, I have learned that by the time you write, edit, and release a chapter, the work is about 4 years behind current literature. After all, the literature was usually out for a year or so before you learned enough about it to write the article! It turns out that writing a book, even one made mostly of your advice on something, is not that much different. For example, The Hidden Curriculum: What They Don’t Teach You At Medical School took about two years to build, edit, and release. By the time it came out, my situation had changed: I had exited a locums company I co-owned, and many things in life were different. So I was left with a question: do I release the book? Do I rewrite completely? The advice and work in the book were very useful, and I realized that only my situation was different. I work with a great medical group and organization of which I can really be proud. So, for that reason, I was able to quickly edit some portions, leave others, and publish on time. Have you ever written something only to have the world change around you? Let me know beneath!